All of us can contribute to dog safety, and keeping human – dog interactions pleasant and rewarding for everyone. Here is some general advice regarding behaviour around dogs. The tips outlined below do not replace any legal obligations you may have, but will help dogs, dog owners, and everyone else get along well together. Pat dogs on their chests – NOT on top of their heads. 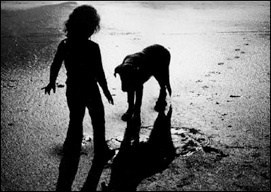 Don’t let your children hug or kiss a dog or approach an eating or sleeping dog or one with puppies. You are likely to come into contact with dogs in a number of situations such as on the street, in parks and recreation areas, in your home or at the homes of family or friends. Knowing how to behave around dogs will help you to deal with them more confidently and thereby minimise any risk of harm. Like humans, each dog has its own temperament and behaviour patterns. This makes generalisation difficult. However, we can understand dog behaviour in terms of control and submission. In the wild, dogs are pack animals with an instinct to strive to be ‘top dog’ within their pack. In play, puppies will often snarl or bite to assert their dominance over their siblings, and their owners. Well-trained dogs have learned that their place in the family is submissive to humans, not dominant. However, even well-trained dogs can revert to aggressive behaviour when they feel threatened or scared. They can also become aggressive if they feel that their territory, food, toys or puppies are threatened, or when they become over-excited by noise or activity around them. An aggressive dog will make itself appear larger by raising its hackles and standing on the tips of its paws. It may also bear its teeth and bark, growl or snarl. It will lay its ears back while raising its tail and it will stare directly at what or who it is threatening. To calm the situation, you should stand still and avoid all eye contact. Look down and keep your arms still and folded in front of you, then slowly and calmly start moving away without turning your back on the dog. By contrast, a frightened dog will make itself smaller by hunching or lying down. It will lay its ears flat and curl its tail between its legs. You can try and reduce the level of fear or threat by speaking quietly and smoothly. Again you should avoid eye contact and move slowly away staying side on to the dog. A playful dog can still be worrying. It may bark without snarling. 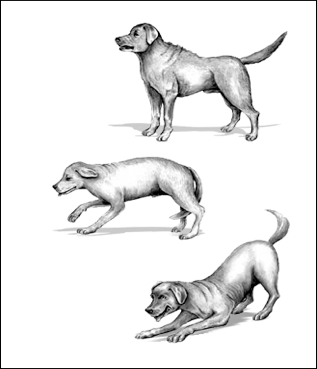 It will approach and retreat – often kneeling down and then jumping up – and it will hold or wag its tail horizontally. A dog that wants you to play may still be frightening, so to make him give up trying to get your attention you should stand still without making eye contact and then walk slowly and calmly away. In all cases, you have a right not to be frightened or annoyed by a dog. If you complain, dog owners should respond courteously and control their dog. If you are concerned, you can contact the Dog Control Officer at your local Council.